Elliott Hines appeared on Show 178, recorded in May 2008, at age 17. 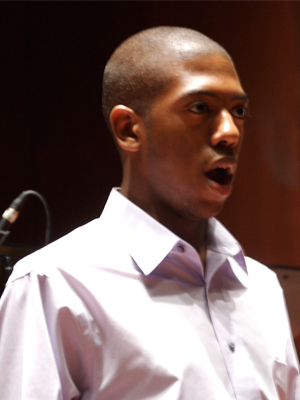 Elliott Hines (baritone), 17, is a recipient of From the Top’s $10,000 Jack Kent Cooke Young Artist Award. He lives in Sugar Land, Texas where he is a senior at Clements High School. He began singing in 8th grade after his guidance counselor accidentally scheduled him into choir and has never looked back. Elliott is a member of the Clements Varsity Mixed Choir and St. Paul’s Choral Scholars. Outside of singing, he is a National Honors student and a fan of NBC’s Heroes. Elliott is a Jack Kent Cooke Young Artist.